Ever see pet beds with really cool covers and $100+ price tags? So do we. But what if we told you that you could totally customize a removable cover and even save a few bucks in the process? All you’ll need is a few yards of your favorite (or your dog’s favorite) design, a pet bed insert, and basic sewing tools. So, if you’re ready to whip up a pet bed to please your pup, grab your materials and let’s get started! Here’s the written tutorial, if that’s more your cup of tea! We've lived in our house for five years now and we're still not done decorating it and fixing it up. Do you ever really get "done" fixing up your house? Maybe not. Or at least maybe not if you enjoy making things for your home and for the people who live there. Maybe a color choice you used to love starts to get old, or you find a fabric you just love and must use somehow. Certainly kids grow and you need new ways of organizing their stuff, and so on. I think of dozens of new projects each week that I want to make for our house so it's probably no surprise that some of my favorite crafting and sewing books are home-dec related. Fortuitously, the kind folks at Chronicle Books recently sent us a copy of author and fabric designer Jennifer Paganelli's new book Happy Home: Twenty-One Sewing and Craft Projects to Pretty Up Your Home, and I immediately found a project that our home needed–or rather, that our sweet new doggy, Ruby, needed. Today we're giving away a copy of Jennifer Paganelli's Happy Home and you can enter the drawing by commenting below or on the corresponding Facebook post by Tuesday, July 3rd, 2012. We'd love to hear what home-dec projects you're working on next, so please do share. And if you think that one of them ought to be a lovely new bed for your favorite canine friend, you're in luck! Jennifer and the folks at Chronicle Books have provided a project exerpt from the book (below) so you can get started now without waiting to find out if you're our giveaway winner. Thanks, Jennifer! If you don't have a deserving doggy, there are 19 other projects in this book with crystal clear instructions and plenty of illustrations to inspire you to sew. I particularly liked the look of the "Millie's Market Tote," the "Broad Brim" sunhat, and the "Crocheted Pillowcase" projects. 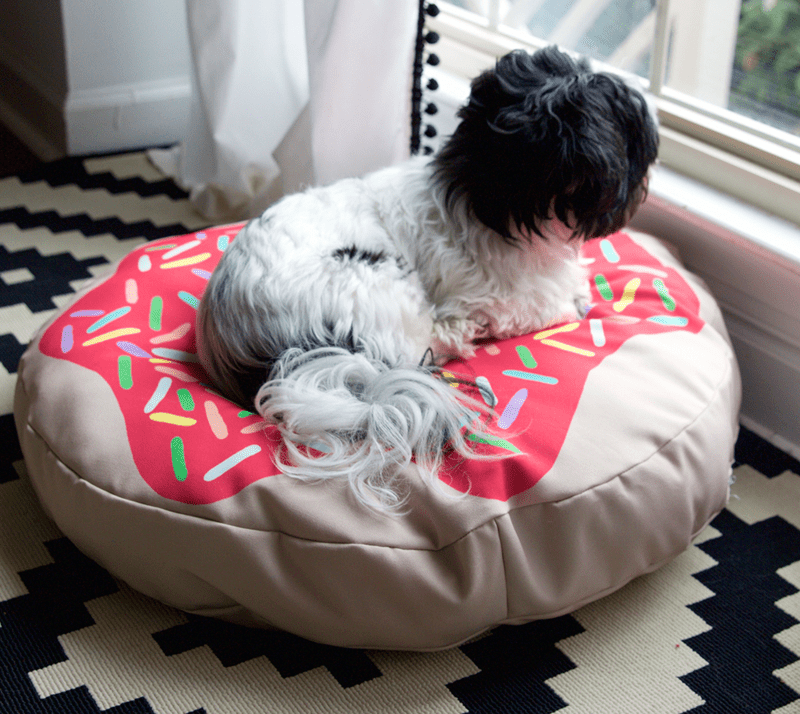 Read on for Jennifer's dog bed how-to! Every member of the family deserves a bit of pampering, even the dog. My dog George is a big Labradoodle, and I had a hard time finding an attractive cover large enough for his bed. I then came up with the idea to cover his bed with a simple patchwork quilt, and now everyone is happy. He likes the bed so much that it was difficult to keep the cover clean for the photo shoot! This is a project where you can use any fabric scraps you have laying around. Note: Since this cover will get a lot of use and needs to be washable, simple quilting stitches will work best (diagonal lines, meandering free motion, or stitch in the ditch). You don’t want to spend time doing delicate hand quilting or tying by hand. We have also given you two options: a quilted top with a quilted bottom or a quilted top with a canvas bottom. From pieced Top and Bottom fabrics, cut seventy 8½-in/21.5-cm squares. From Backing fabric, cut two 60-by-44-in/152-by-112-cm rectangles. From Batting fabric, cut two 60-by-44-in/152-by-112-cm rectangles. From pieced Top fabrics, cut thirty-five 8½-in/21.5-cm squares. From Backing fabric, cut one 60-by-44-in/152-by-112-cm rectangle. From batting fabric, cut one 60-by-44-in/152-by-112-cm rectangle. A For each quilted side of the cover, randomly lay out 35 squares in a grid of 5 squares by 7 squares. B Starting with the top horizontal row, pin and sew all the squares, with right sides together, using a ¼-in/6-mm seam allowance. Press the seam allowances to the left. Return the completed strip of squares to the layout. C Sew the second horizontal row of squares, with right sides together, using a ¼-in/6-mm seam allowance. Press all the seam allowances to the right. Return the completed strip to the layout. E Pin the first 2 strips, right sides together, carefully matching each vertical seam between each square. Sew together with a ¼-in/6-mm seam allowance. Press the seam down, toward the lower strip. Repeat until all 7 strips are sewn together. F Repeat steps 1B to 1E if making the quilted Bottom. A Lay the Backing piece flat on the floor, right-side down, and tape the edges to floor with masking tape. Lay the Batting on top of the Backing. Smooth out any wrinkles, and then place the pieced quilt Top, right-side up, centered on the Batting. Smooth out any wrinkles. The Top will be about 2 in/5 cm smaller on all sides than the Batting and Backing. B Fold back the Batting and Top so the upper half of the wrong side of the Backing is visible. Spray the Backing and Batting lightly with basting spray. Gradually roll the Batting into place over the Backing. Smooth out any wrinkles as necessary. Then lightly spray the Batting and the wrong side of the Top with basting spray. Gradually roll the Top into place over the Batting. Smooth out any wrinkles. Repeat for the lower half of the quilt. These 3 layers are now called the quilt sandwich. C Starting from the center of the quilt sandwich and working your way to the edges, use safety pins to attach all 3 layers together. D Repeat steps 2A to 2C if making the quilted Bottom. A Quilt the sandwiched layers together using your preferred method. B With the fabric marker and the ruler, draw a 51-by-36-in/130-by-91-cm rectangle centered on the Top. (See illustration.) Cut off the excess Top, Batting, and Backing, making sure that the corners are square and the edges are straight. C Repeat steps 3A and 3B if making the quilted Bottom. D Finish the raw edges of the Top and Bottom with a zigzag stitch or a serger. B Place the Top and Bottom of the cover with right sides together, align the 3 raw edges, and pin. Sew together with a ½-in/12-mm seam allowance, pivoting at each corner. Trim off the corners, and press the seams open. D Turn the cover right-side out through the zipper opening, and insert dog bed. Here is Jennifer's original version of this project. Her dog looks much bigger than Ruby but he still fits comfortably on the bed along with his adoring friend! Last week, we gave away a set of Gingher shears, pinking shears, and thread snips, and I think it's safe to say that a lot of you could really use some nice scissors. Sadly, we could only choose one winner, Zoe Brench in the Netherlands. Congratulations, Zoe, and we'll be sending you your lovely new set soon!